The beloved sheriff Harry S. Truman might be leaving Twin Peaks , but that's not to say there aren't plenty of newcomers to take his place. 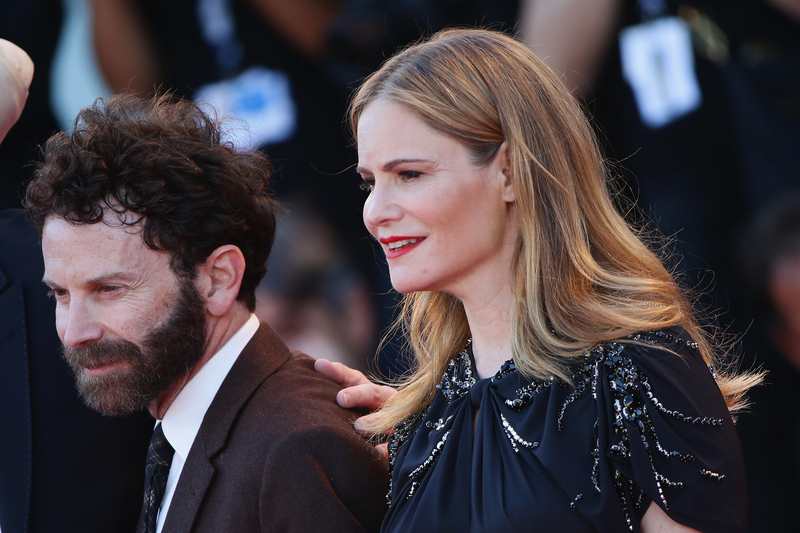 Recent reports indicate that Jennifer Jason Leigh might join the Twin Peaks reboot. At least, a figure that looks like her was spotted in a paparazzo photo from earlier this week. The cast, including Kyle MacLachlan, was shooting a night scene in the Mojave desert when they were caught on camera. The original Laura Palmer, Sheryl Lee, was also among the identifiable figures. Many actors among the core cast have told various news outlets that they'd be happy to return for the rebooted series. Madchen Amik (Shelley), Richard Beymer (Ben Horne), Kimmy Robertson (Lucy Moran), and Peggy Lipton (Norma) have all coyly hinted that they'll appear on screen again, according to Digital Spy. (Aside from MacLachlan, none of them are officially confirmed.) But seemingly just as many beloved characters won't be reappearing — in addition to Michael Ontkean dropping out, the original Log Lady, Catherine Coulson, died earlier this year. Joan Chen, who played Josie Packard, apparently asked to be written out of the show, she wrote on her blog last year (not without a touch of resentment at her younger self). Naomi Watts was superlative in Lynch's classic thriller Mulholland Drive. It was the role that gave her a break, and now Lynch seems to be looking to cash in the favor, courting Watts for a role in the Twin Peaks reboot. Perhaps an heir to BOB? Frank Silva, the original Twin Peaks baddie, died in 1995, making it unlikely that the character will reappear for the new series. Yet Robert Knepper, best known for his role in Prison Break, has a reputation for playing genuinely chilling characters, which would make him a worthy successor to the original BOB. With his craggy features and tight-lipped smile, Robert Forster would be well at home among the Twin Peaks denizens. He also appeared in Mulholland Drive — as well as Quentin Tarantino's Hateful Eight, which leads me to ponder some really kooky cross-casting possibilities if the Tarantino and Lynch universes were to collide. Digital Spy noted that Forster was originally considered among possible candidates for Sheriff Truman's role, so perhaps that one will be re-cast. Alias star Balthazar Getty has been reported among the cast members, though like the rest of the pack, his precise role hasn't been confirmed. Screen Crush hypothesized that, due to his similarity to the late Frank Silva, he might be a rebooted BOB. News of his rumored casting was accompanied by the minor detail that a few original roles would be re-cast, after all. Will he or won't he? Okay, so Peter Sarsgaard was originally reported to be in the new Twin Peaks cast, but now he's gone back and set the record straight. No, he says, he won't be in the new series, but "it certainly was a rumor that was not founded on nothing," he told Entertainment Weekly. I'm still holding out hope. Welp. Even without Peter Sarsgaard, there's still plenty to be excited about! The anticipation of a Twin Peaks reemergence alone is something — and now we have all these tantalizing rumors floating around. David Lynch, I'm calling on you to set the record straight. I don't think I can do this much longer.